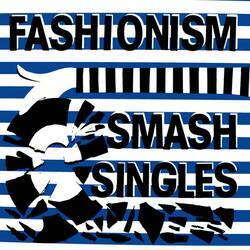 Smash Singles collects all previous releases of Fashionism. Four singles to be precise (released between 2015 and 2017): Smash The State (With Your Face), Quit Looking At The Time, Suicide and Back In The Day. As a bonus the tracks "Weekend" and "Baby She's Gone" are included here as well. That last song is also the b-side of Come On My Baby, their fifth EP. Let me get back on that shortly. Fashionism is a Canadian band playing 70's punk and power-pop influenced music. The promo sheet tells me the band is comprised of scene veterans known for playing The Tranzmitors and The Jolts. Two bands that I have never heard of before, to be honest. Anyhow, they must really dig the stuff from the late 70's. What they play themselves sounds like it could be written back in the day. I do appreciate that low budget production charm from that era, but I feel it didn't always benefit the music. Therefor I tend to prefer later day production jobs most of the time. With the same budget much more magic can be achieved. So, I'm happy to tell you that production wise it's clearly not a 70's recording. Smash Singles is a surprisingly consistent sounding collection of songs. I expected it would be a mish mash of different production values, but Fashionism found their sound right away and have stuck with it ever since. This improves the listening experience greatly to me. Especially as Fashionism choose to not display their songs chronologically. It might appear as if they heaped their songs on one big pile and just randomly picked songs to fill this album. At first I thought I found pattern as the first three songs are the a-sides of the first four albums, but the a-side of their fourth single is only track number six. Odd choices all around. The album has a nice flow, so either this is a well thought out tracklist or the band is extremely lucky in picking the song order. Another surprise is the consistent quality offered here. There is only one song I don't really like: "Baby She's Gone". It has a more punky, New York Dolls rock-vibe compared to the other songs on here. I do like the piano-appearance in this song, but even with a running time of just over three minutes I feel the song could use some editing. It is a bit repetitive, which is never a good thing in music. It strikes me as extra odd that Fashionism choose precisely this song as a b-side to their latest single Come On My Baby. It's title track features Fashionism at their absolute best. It's ultra catchy and upbeat. In fact it is so catchy it had me singing along half-way through the song. Although none of the tracks on Smash Singles are as strong as "Come On My Baby" they tend more to that song than to "Baby She's Gone". My absolute favourite track on Smash Singles would be "Smash The State (With Your Face)", another infectiously catchy track, but to be honest, almost every track here is a winner. I could argue that after five singles it's about time for a full length, but for me, if a rhythm like this works for Fashionism I can only encourage them to keep releasing singles and every once in a while combine those songs on one album for lazy bums like myself. Posted Aug. 20, 2018, 6:49 p.m.